Despite the Stuka's vulnerability to enemy fighters having been exposed during the Battle of Britain, the Luftwaffe had no choice but to continue its development of the Ju-87, as there was no replacement aircraft in sight. The result was the D-series. In June 1941, the RLM ordered five prototypes, the Ju 87 V21–25. A Daimler-Benz DB 603 powerplant was to be installed in the Ju 87 D-1, but it did not have the power of the Jumo 211 and performed "poorly" during tests and was dropped. The Ju 87 D-series featured two coolant radiators underneath the inboard sections of the wings, while the oil cooler was relocated to the position formerly occupied by the coolant radiator. The D-series also introduced an aerodynamically refined cockpit with better visibility and space. In addition, armor protection was increased and a new dual-barrel 7.92 mm (.312 in) MG 81Z machine gun with an extremely high rate of fire was installed in the rear defensive position. Engine power was increased again, the Jumo 211J now delivering 1,420 PS (1,044 kW, 1,401 hp). Bomb carrying ability was nearly quadrupled from 500 kg (1,100 lb) in the B-version to 1,800 kg (3,970 lb) in the D-version (max. load for short ranges, overload condition), a typical bomb load ranged from 500-1,200 kg (1,100-2,650 lb). The D-2 was a variant used as a glider tug by converting older D-series airframes. It was intended as the tropical version of the D-1 and had heavier armour to protect the crew from ground fire. The armour reduced its performance and caused the Oberkommando der Luftwaffe to "place no particular value on the production of the D-2". The D-3 was an improved D-1 with more armour for its ground-attack role. A number of Ju 87 D-3s were designated D-3N or D-3 trop and fitted with night or tropical equipment. The D-4 designation applied to a prototype torpedo-bomber version, which could carry a 750–905 kg (1,650-2,000 lb) aerial torpedo on a PVC 1006 B rack. The D-4 was to be converted from D-3 airframes and operated from the aircraft carrier Graf Zeppelin. Other modifications included a flame eliminator and, unlike earlier D variants, two 20 mm MG 151/20 cannon, while the radio operator/rear gunner's ammunition supply was increased by 1,000 to 2,000 rounds. The Ju 87 D-5 was based on the D-3 design and was unique in the Ju 87 series as it had wings 0.6 metres (1 foot) longer than previous variants. The two 7.92 mm MG 17 wing guns were exchanged for more powerful 20 mm MG 151/20s to better suit the aircraft's ground-attack role. The window in the floor of the cockpit was reinforced and four, rather than the previous three, aileron hinges were installed. Higher diving speeds were obtained of 650 km/h (408 mph) up to 2,000 m (6,560 ft). The range was recorded as 715 km (443 mi) at ground level and 835 km (517 mi) at 5,000 m (16,400 ft). The D-6, according to "Operating instructions, works document 2097", was built in limited numbers to train pilots on "rationalised versions". However, due to shortages in raw materials, it did not go into mass production. The D-7 was another ground attack aircraft based on D-1 airframes upgraded to D-5 standard (armor, wing cannons, extended wing panels), while the D-8 was similar to the D-7 but based on D-3 airframes. The D-7 and D-8 were both were fitted with flame dampers, and could conduct night operations. Production of the D-1 variant started in 1941 with 495 ordered. These aircraft were delivered between May 1941 and March 1942. The RLM wanted 832 machines produced from February 1941. The Weserflug company was tasked with their production. From June to September 1941, 40 Ju 87 Ds were expected to be built, increasing to 90 thereafter. Various production problems were encountered. Just one of the planned 48 was produced in July. Of the 25 the RLM hoped for in August 1941, none were delivered. Only in September 1941 did the first two of the planned 102 Ju 87s roll off the production lines. The shortfalls continued to the end of 1941. During this time, the WFG plant in Lemwerder moved production to Berlin. Over 165 Ju 87s had not been delivered and production was only 23 Ju 87 Ds per month out of the 40 expected. By the spring of 1942 to the end of production in 1944, 3,300 Ju 87s, mostly D-1s, D-2s and D-5s had been manufactured. Total production amounted to 3639 Ju 87D (592 D-1, 1559 D-3 and 1448 D-5), all built by Weserflug. The last Ju 87 D-5 rolled off the production lines in September 1944. 46 Ju-87D-2 and D-3 were operated by Italy's Regia Aeronautica prior to the Armistice. Hasegawa's Ju-87 series has been a good seller for the Japanese company. I remember when they were first released and they sold very well. After that first rush, Hasegawa has settled down to doing what they do best, and that is Limited Editions. This particular one is the short wing Ju-87D and the inclusion of metal flame damper exhaust has succeeded in raising the price of the kit, as it usually done. Frankly, the exhaust could use some sort of p.e. for the front as they are just blank faces with a slightly hollowed out rear sections. Not sure if Quickboost does some, but they would be better detailed, I would think. Anyway, the kit has what is pretty much standard stuff for the Early Ju-87 with a newer canopy, rear guns, engine cowling assembly and landing gear to match up with the later D model. The interior is fairly well done with detailed sidewalls, pilot and gunner's seats. Rudder pedals are molded into the floor. The modeler will need to trim a bit on the interior before building. As many of us dislike, there are separate prop blades, but these are the correct paddle blade versions and are keyed. There are rubber inserts to hold the prop on the shaft so smart modelers will be able to wait until after painting to install the prop. Holes will need to be opened in the lower wing sections for the dive brakes and the outer wing bomb racks. The kit does include bombs for these areas. There are also standard exhaust as one of the two options does not use the dampers. Both of the kit markings are in RLM 70/71/65 in a tight splinter pattern. I know the first Ju-87B boxing had paper masks for this pattern, but I don't see any in with this boxing. The box art plane is with 216 Squadriglia, 121 Gruppo with the one without the dampers being with 207 Squadriglia, 103 Gruppo. Both in summer of 1943. Decals are nicely printed, but old school and so the whites are off-white. I suggest painting on the fuselage band. Note that there are decals to fit inside the canopy to simulate the sections of plexiglas being fastened together. 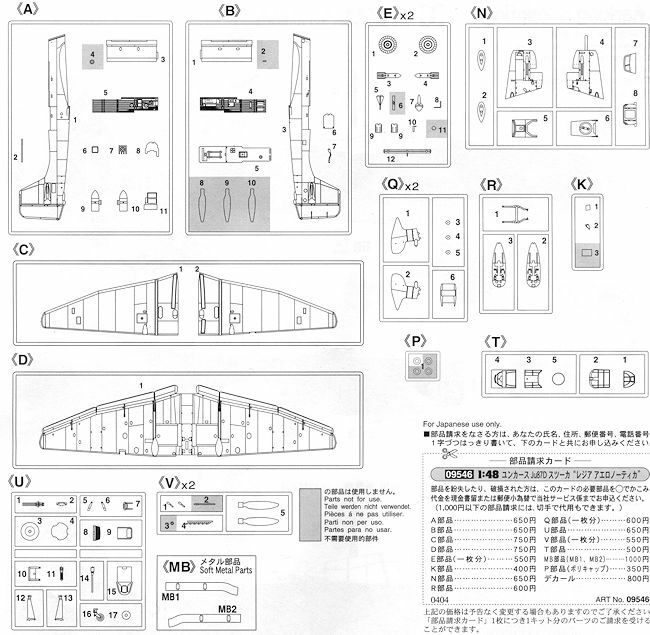 A nice choice of markings options for the still nice Hasegawa Ju-87. I have built but one, but have several on the stash shelf (now one more). I recall enjoying that earlier build and I'm sure this one will be just as nice. My thanks to me for lucking out in the raffle.